Hello everyone! 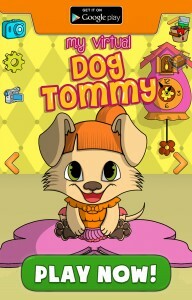 Let us introduce you to the cutest virtual pet – Tommy! Dog games for kids have never been so cute! In these virtual pet games you will make a wonderful new friend! You can dress him, bathe him, feed him, even play mini games with him! Dogs games just got a new star! If you are looking for a sweet virtual pet that you can always carry with you, search no more! Everything you need is right here in these free games for girls and boys! 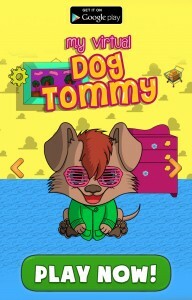 Download My Virtual Dog Tommy NOW! If you are longing to get a puppy, but you are not quite sure if your are ready just yet, virtual dog games are just the thing! Puppy Tommy is simply the cutest! You can dress him, and even put costumes on him in these dog games for kids and he will never complain! On the contrary! He longs for your attention and care. 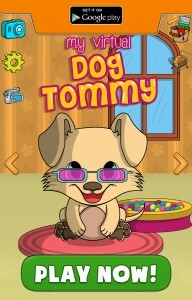 Without your proper care in these virtual pet games Tommy might even get sick! Tommy is waiting for you in fun games for girls and boys! Play mini games with Tommy and compete with your friends on every leaderboard! Your virtual pet can become the star amongst all other virtual pets. Cool games are about to become even cooler! 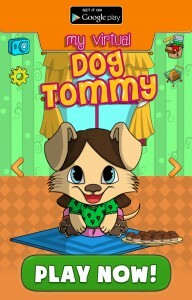 With Tommy in dog games for girls and boys, virtual pet games are on a whole new level! ♥ Name the character at the very beginning of the dogs games. ♥ Talk to Tommy and he will repeat everything that you say. ♥ This puppy often gets messy, so make sure you bathe it regularly in these dog games for girls and boys. ♥ Play him different music or play mini games with him, and he will stay in a good mood. 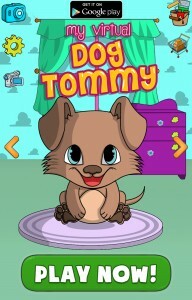 ♥Put Tommy to sleep in this new virtual pets game. ♥ You can also play dress up games with the puppy. ♥ Change wallpapers, floor, carpets or put different pieces of furniture. ♥ Achieve new levels in free games for kids and get amazing gifts. Don’t miss out on the opportunity to play mini games with this sweet puppy. With over 10 mini games like Flappy Dog, Bubble Shooter or Tic Tac Toe you will never get bored in these cool games.